Most of us, store a large number of photos that capture various stages of our life or moments. Images that surely after you want to edit and maybe share them on social networks. What many don’t know is that in Windows 10 you have the possibility to perform multiple tasks on the metadata of an image and thus adjust each image according to your preference. 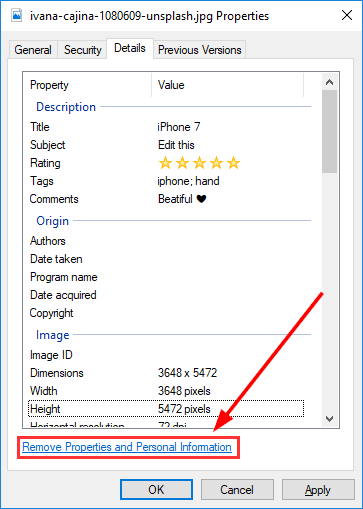 What is the metadata or EXIF? At the moment you capture a photo, you aren’t only capturing what the focus takes, behind this you are storing extra information such as the model of the camera or phone, coordinates on where it was taken, time and date, etc. EXIF (Exchangeable Image File Format) is the set of data that describes an image or photograph and is synonymous with metadata. All these additional information are known as metadata. Sometimes you want to update this data in a simple way in Windows 10. Description: There you can see information such as comments, rating, title , etc. Origin: Date, time and author of the image . Image: Details of the image as dimensions, Compression, Bit Depth, etc. Camera: Find information about the device that took the image such as Manufacturer, Model, Flash Distance, etc. Advanced Photo: Details of the shot such as contrast, brightness, saturation, etc. To edit the metadata, some fields are editable by double-clicking on them, for example, in the Description and Origin field. All in the Description field. All of the Origin field. From the field Camera: You can edit Manufacturer, camera model, speed. ISO, measurement mode and flash mode. From the advanced photo field, you can edit all except digital zoom and brightness . The other fields are not editable. Once you have made the necessary changes, click on the Apply button to save the changes. All the information provided by metadata is important to know in detail all aspects of our photos but at the same time, it can be an element likely to security errors for certain people and in certain situations. As you see some elements it’s not possible to edit them, in this case, the solution offered by Windows 10 is to partially remove information from the metadata in the image. 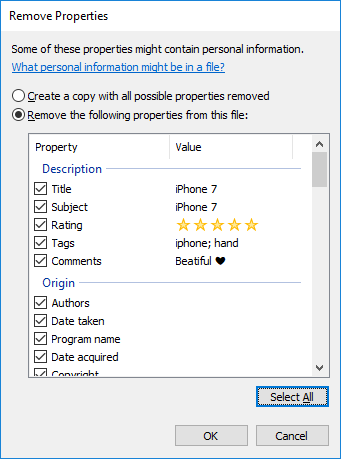 Create a copy with all possible properties removed: This option allows us to save a copy of the image by automatically removing the properties defined by the system. 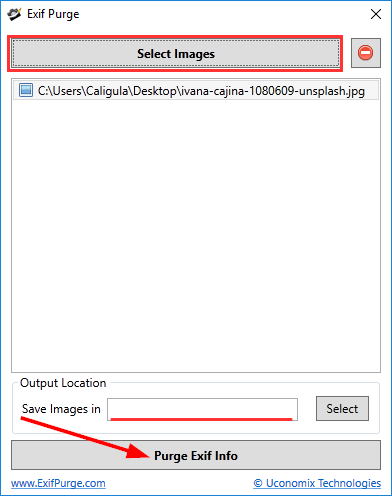 Remove the following properties from this file: Using this option you can set which properties have to be removed from the selected image, simply activate the respective boxes. Click OK and if you go back to the image these properties will not be available anymore. Once you download the tool, you only have to click on Select Images to upload the images which you want to remove the EXIF Data. You can also choose the output fold,er. 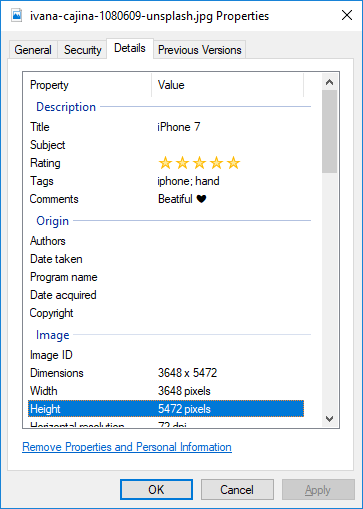 Click on Purge Exif Info and the metadata will be removed from your photographs. 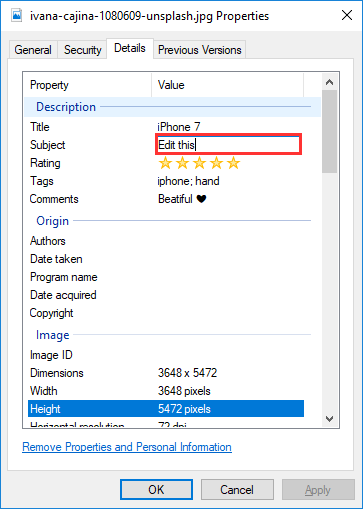 As you can see you have easy methods to edit, add or remove EXIF data, although many times you forget that the Windows 10 search is based on the information contained in the metadata.